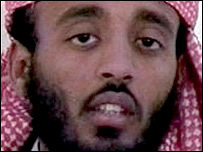 Captured in Pakistan in September 2002, the Yemeni national is allegedly one of the most senior al-Qaeda members to be arrested. Binalshibh, who is 30, is said to have become a key member of the al-Qaeda cell in Hamburg, Germany, after seeking asylum there in the late 1990s. According to officials, he met Mohammed Atta, the leader of the Hamburg cell and one of the alleged masterminds of the 11 September attacks, through a local mosque in 1997. Intelligence officials say Mr Binalshibh may also have been involved in the attacks on the USS Cole and a Tunisian synagogue. ... arrested in Spain on charges related to Islamic extremism were based in Catalonia, a quarter of them in Barcelona. In July 2001, two months before the 9/11 attacks in New York, Mohammed Atta, who led the attacks, met Ramzi Binalshibh, the link man between Atta's group and al-Qaida, in Cambrils. The letter was sent earlier this month by Denbeaux to James Harrington, a civilian lawyer appointed to represent Ramzi Binalshibh, one of five Guantanamo prisoners facing trial by military commission for their alleged roles planning and providing logistical support for the terror attack on Sept. 11, 2001. ... including 9/11 masterminds Khalid Sheikh Mohammed (KSM), Ramzi Binalshibh, Ali Abdul Aziz Ali and Mustafa Ahmed Adam al Hawsawi. Because neither is able to be present, James Harrington, counsel for Ramzi Binalshibh, requests that the testimony be delayed until May, and Judge Pohl agrees. It has been reported that a high profile terrorist responsible for American soldiers' deaths has been struck down by a U.S. airstrike. This Week at the Military Commissions, 3/21 Session: "Who is Greg Sansig?" We kick today's session off as usual with attendance. Defendants Walid Bin'Attash, Mustafa al Hawsawi, and Khalid Shaikh Mohammad have all waived their right to be present at today's sessions; only Ramzi Binalshibh and Ammar al Baluchi chose to attend. "Had we had notice, obviously there would have been much more litigation," says James Harrington for Ramzi Binalshibh. "It may not have been successful litigation, but [there] would have been substantial litigation on this point. This Week at the Military Commissions, 10/14 Session: Joint Defense Agreement? What Joint Defense Agreement? Wednesday's session opens up with Jim Harrington, counsel for Ramzi Binalshibh arguing in favor of 152JJJ, a request for testimonial immunity for Abu Zubaydah in connection with Binalshibh's motion to hold the guards in contempt for poor camp conditions. Peter Bergen's 'United States of Jihad: Investigating America's Homegrown Terrorists' extensively deals with the terrorist threats to the United States of America. PHIL HIRSCHKORN: The government says Khalid Shaikyh Mohammed, known as KSM, was the architect who brought the planes plot to al Qaeda leader Osama bin Laden.